petition: Support the Equality Act! In 31 states, anyone who identifies as LGBTQ is at risk of being fired from their job … refused housing … or denied services just for being their authentic selves. For us, that's 31 too many. Right now, 244 members of Congress -- 198 in the House and 47 in the Senate -- have co-sponsored the Equality Act. That's still not enough. 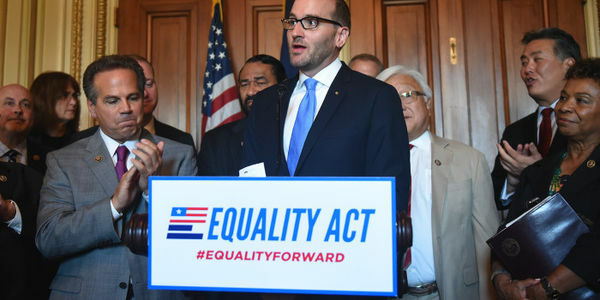 We need fully-inclusive non-discrimination protections for all LGBTQ people across the country -- and that's exactly what the Equality Act would guarantee. Add your name to suppory fully-inclusinve non-discrimtnation protections for all LGBTQ people. This legislation would provide comprehensive non-discrimination protections on the basis of sexual orientation or gender identity — and cover the full range of non-discrimination protections we need in schools, employment, housing, credit, public places, federally funded programs and jury service. No LGBTQ person is truly equal until we all are. Add your name to show your support for the Equality Act.